We are pleased to announce the launch of Power Manager and Power Manager Professional 4.1.5. This update includes new tasks in the Schedule Assistant, adds Notification Center support for Mac OS X 10.8, and improves performance. The new Schedule Assistant tasks focus on making popular schedules even easier to create. Tasks are now available to start and stop Keynote and PowerPoint presentations. A new Automator workflow task helps avoid needing to deal directly with shell scripts and the command line tool 'automator'; the task does the set-up for you. We also added a task to start and stop the playback of movies in QuickTime Player. Movies can be played fullscreen and set to loop as needed. Great for presentations. Surprisingly the QuickTime play task was more complex than expected to create. While QuickTime Player supports AppleScript, dealing with potentially slow loading movies required some non-trivial embedded AppleScript. Thankfully the new task deals with the complexities for you. For those running Mac OS X 10.8, Power Manager now supports the Notification Center. Notifications are published whenever a warning is displayed. The notifications stick around to act as a record of past events; useful for tracking events performing over a few days. And finally, Quick Schedule has been extended to make it easy to schedule log out, sleep, or shut down in 2, 10, 30, or 60 minutes time. Hold down modifier keys to reveal different times. The control, option, command, and shift keys are modifiers. This small improvement makes a big difference day-to-day. Added: Added Automator tasks for working with workflows. Added: Added Keynote tasks for playing and stopping presentations. Added: Added PowerPoint tasks for playing and stopping presentations. 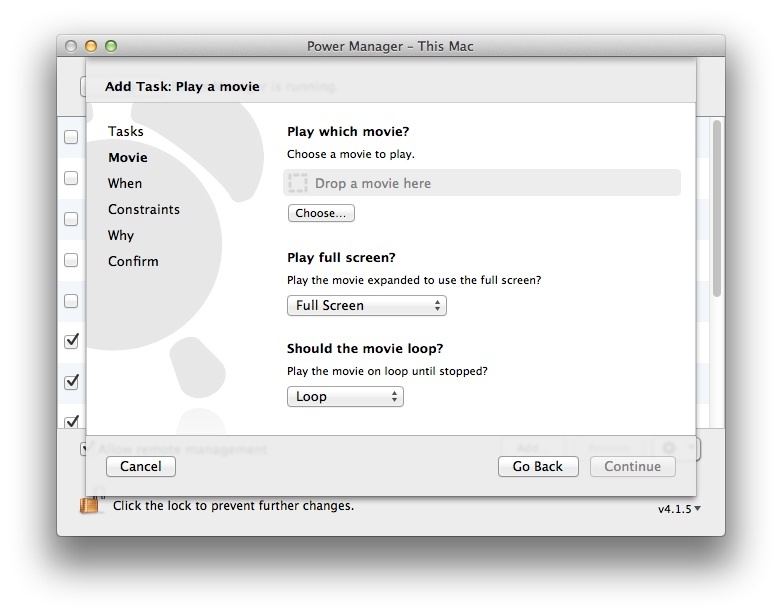 Added: Added QuickTime tasks for playing and stopping movies. Added: Extended Quick Schedule to allow sleep, restart, and shut down after short delay. Added: Notification Center support for pending and warning events (Mac OS X 10.8). Added: Added in-application feedback and crash reporting.